I’ll preface this piece by saying we’re still waiting for a lot of the equipment for the Canon C700 to be available, so it’s only fair to call this more of a First Impressions than an actual review. However, Canon’s C700 is a highly-anticipated product, so I thought I’d take a barebones kit out for a test, write up my initial thoughts, and share some sample footage for those of you interested to see what this camera can do. In the full review, we’ll address RAW recording, viewfinder options, the control unit, the shoulder mount, and lens grip accessories. For this preview, though, I’m focusing only on internal recording and the camera itself, specifically the EF mount version without a global shutter. I guess I’ll start with aesthetics. 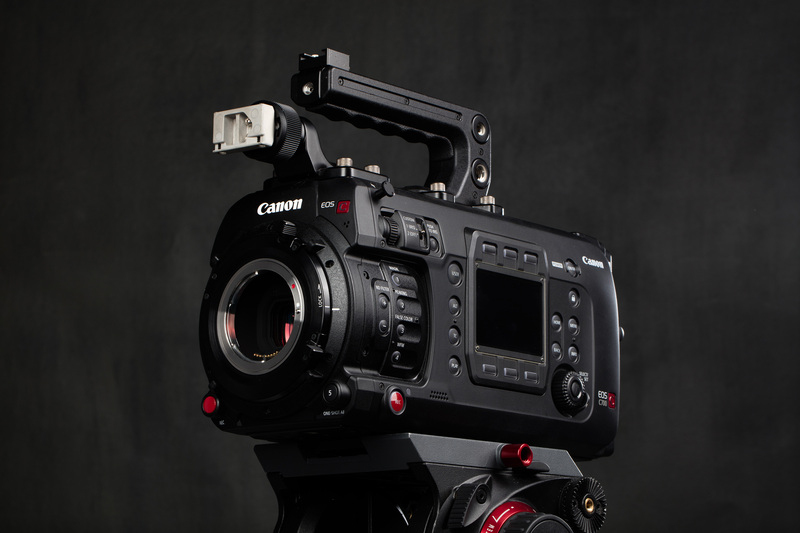 The Canon C700 basically looks like someone welded a big rectangular box to the back of a C300 Mark II. The two cameras share a sensor and many of the same features, including dual-pixel autofocus (on the EF version), 4K resolution, internal ND filters, CFast media, and 4:4:4:4 recording in 2K. In fact, unless you spring for the RAW recorder attachment, you’re not getting much out of the Canon C700 that you couldn’t get out of a Canon C300 Mark II. Sure, you’ll have 60p in 4K, 240p in cropped 2K, more input/output options, surround view, a more ENG-friendly body shape, and a few other features, but that’s not much considering that the price difference between the two cameras is around $17,000. That’s not to say that this isn’t an excellent camera, though, just that you’ll want to rent the Codex RAW recorder to get the most out of it. On the positive side, there’s a lot to like here so far. Foremost, the dual-pixel autofocus is just as functional and helpful as it is on the C300 Mark II. I know there are fewer people who will use that feature in a cinema-focused camera like the C700, but it’s remarkably effective. There’s a shot at about 2:40 in the sample videos below that I think illustrates how handy the autofocus features can be under the right circumstances. I had the camera on a tripod about 100 feet away from my subject. The lens used in the test footage is a Canon 70-200mm f/2.8, wide open, zoomed in all the way to 200mm. As a test, I set the C700 to track his face while he walked straight toward the camera. The shot in the video was the first take, with no AF setting adjustments. You can see that the camera loses him very briefly about halfway through, but picks him right back up almost immediately. With a focus throw as short as the one on the 70-200mm, I’m secure enough in my focus pulling abilities to admit that the camera did a better job on this shot than I could have, especially on the first take. Dual-pixel autofocus might not be something you’d want to use on every shot, but it’s great to have when it’s needed. Shooting 60p at 4K is also a feature a lot of people were disappointed to see missing from the C300 Mark II, and is another huge plus for the new Canon C700. High frame rate footage shot at a 2K crop is noticeably softer than native 4K footage, even when finishing in 1080, so it’s great to have at least slightly slow motion available in 4K. Finally, it’s nice to see Canon embrace a more professional standard for menu navigation. The control panel will be familiar to anyone who has worked with an Alexa, F5, Varicam, or any number of other cinema cameras in the last couple years. While the menu system isn’t flawless, it’s a lot easier to navigate than the one on the Canon C300. Professional users will also be glad to find more options for user-defined buttons. I’m reserving any strong judgments on the Canon C700 until we get more accessories available for it. I think the RAW recorder and support equipment will add a lot regarding feature set and usability. That said, it’s promising so far. I’m just not sure it’s enough to entice people away from other cameras in this class, like the RED Weapon or Arri Alexa. Below you’ll find links to both graded and ungraded edits of some of the sample footage I shot. Uncompressed files straight from the camera are also available if you want to try a grade of your own. There are a lot of them, and they’ll take a while to download, so I’d start with these four: A001C029, A001C036, A001C043, and A001C046. As always, feel free to comment if you have any questions. Click here to download some of the RAW sample footage to colorgrade. Thanks for the article, Ryan; very interesting. I noticed that the sample footage isn’t raw but XFAVC. Do you have any raw format sample files you could post? Thanks! Menus I can handle. It’s the horror stories I hear about mysteriously intermittent cable shorts and incompatible firmware that scare me….Thanks for your reply. It’s certainly less modular than the RED, but I wouldn’t necessarily call it simple, especially once the Codex recorder is involved. As an operator, it felt closer to using an Alexa or F55 than a C300, at least in terms of menu structure. Here’s how it would entice me. I’m totally afraid of the Red and to a lesser extent the Alexa because I have no idea how all those boxes and cables fit together and even less of an idea about how to deal with system crashes, cable incompatibility, and those crazy batteries. So, if the Canon is just a nicer version of the C100/300 with most of the same controls and known work-arounds and is more of a “slap a lens on, plug in a recorder, and go” type of camera then I’m in.